Sexual dimorphism is a tidy phrase that means males and females of a species can be distinguished by their size, color, shape, or structure. Such phenotypic differences are familiar: male African lions have their manes; whitetail deer, their antlers; and the peacock, his stunning plumage. The breeding plumage of many Maine birds provides other examples⎯the male wood duck, the hooded merganser, cardinal, pileated and other woodpeckers, or any of the spring warblers⎯to name a few. For the most part, we take this dissimilarity for granted, which is to say, that when one member of a pair stands out, we assume it’s the male. Typically, our male songbirds are larger and/or more brightly colored than the female. This predominant pattern is understood to be the result of sexual selection. The bigger or more brightly colored male with the robust voice selects and defends the desirable territory, as a result of which he is favored over other males by the female. By contrast, the cryptically colored female is “advantaged” when she sits on her nest. There, her relative invisibility makes it less likely that she will be spotted by a predator. Such typical sexual dimorphism is not universal, however. Two familiar examples: male and female adult common loons look alike, but the male outweighs the female. On the other hand, while killdeer sexes also look alike, the female killdeer is larger than her mate. 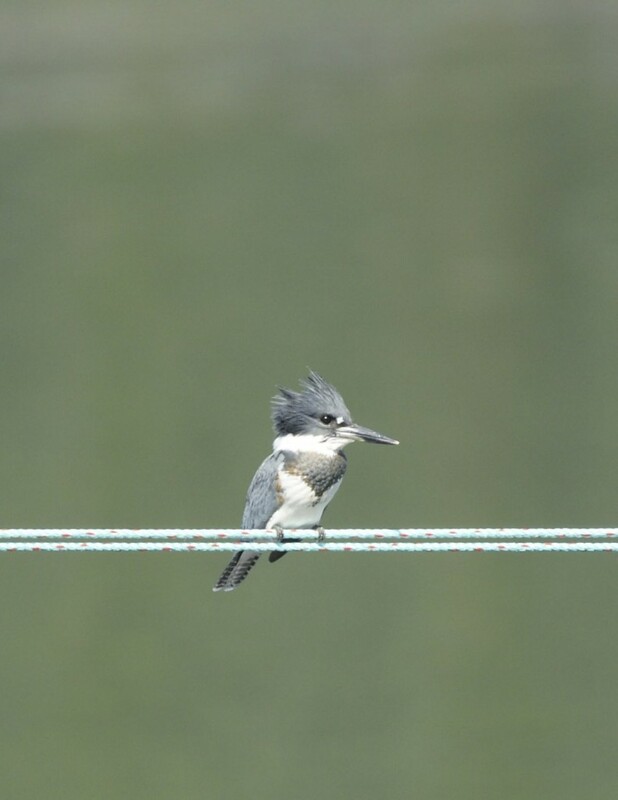 Or consider the eastern belted kingfisher: male and female are the same size, but her plumage is more distinctive. Such phenotypic diversity is difficult to explain in any terms other than a competition for survival, but the mechanisms⎯the why and how⎯for this are not always understood. What follows is a brief discussion into the complicated world of sexual dimorphism and a couple of suggested explanations. If the larger and/or more brightly colored male represents typical sexual dimorphism, what are the noteworthy exceptions? Raptors are the first to come to mind. Among many of these birds, the female is larger. Numerous hypotheses have been advanced to explain this phenomenon. The authors of The Birder’s Handbook propose that reversed sexual dimorphism in raptors is closely correlated to prey agility. They support their hypothesis into three categories. The first classification includes accipiters and falcons, such as sharp-shinned hawks and peregrine falcons, i.e., birds that specialize in hunting fast-moving birds. The females of these species are much larger than their mates. The authors advance their argument with the observation that a large female is relatively safe from attack from the smaller male, while he is well equipped to provide food for her and the young. In other words, she gets what she needs without threat of violence to herself. As peregrines are superbly evolved to kill other birds, the males “represent the greatest threat to their own mates.” The second category includes the buteos, such as red-tailed and rough-legged hawks, which hunt for small mammals that are relatively slower. These birds occupy a middle ground, the female being only slightly larger than the male. The last category includes the vultures, which primarily eat carrion or the relatively helpless young of other species, i.e., prey that is inert or nearly so. Male and female turkey and black vultures incubate their eggs. With these birds, male and female are the same size. Owls offer another example of reverse sexual dimorphism. In many, but not all the species, the female is larger than their mate, and again several explanations have been put forward. Arne Lundberg, a Scandinavian ornithologist writing about European owls, suggests that, given a division of labor, a small, agile male with short wings is best suited for hunting, while a larger female has a better chance of survival in cold weather without food⎯at least when the interval between feedings is long and food is served up by the male. In other words, unlike the peregrine, the smaller male owl is not a threat to his mate, but his smaller size provides him with a better chance of hunting success. The belted kingfisher (Ceryle alcyon)⎯same size, similar behavior, but different plumage⎯is another easy bird to recognize. (One early Maine settler, aptly observed: “Kings fishers, which breed in the spring in holes in the Sea-banks.…” J. Josselyn, 1674.) The female is distinguished from her consort only by a chestnut colored band across her breast below the slate-blue band that is found on both genders. Their large, crested head, massive bill, the white spot in front of the eye, chattering call, and dramatic headfirst plunges into fresh or saltwater⎯be it a stream, river, pond, or tidal body⎯are unmistakable, especially here in Maine where it is our only kingfisher. With kill in hand, the kingfisher may retreat to an excavated burrow located near the top of a bank. [See photo.] 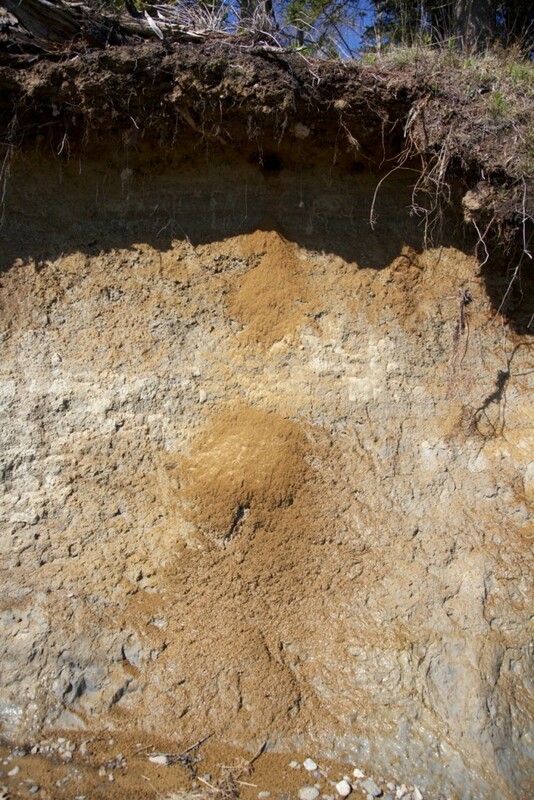 This burrow may be up to 15 feet long at the end of which the female lays 5-8 white eggs. (According to Audubon these eggs provide “fine eating,” although extracting eggs from the protective grasp of the parents is said to be a challenge.) Unlike an open-air nest, the burrow confers protection, and there is no need for camouflage by either male or female, both of whom incubate. A kingfisher’s diet includes amphibians, insects, reptiles, and small birds⎯sparrows, for example⎯ as well as oysters, squid, butterflies, and moths, but small fish are its preferred prey. On occasion they will strike one that is too large to carry away and will be forced to release its victim. Just like owls, they eject the indigestible portions of their food as pellets. Parents instruct the young fledglings to retrieve morsels of food that the adult drops into the water from perches. Maine kingfishers generally winter as far south as northern South America, one might describe them as reluctant migrants as they have been seen in-state during every month of the year accept January and February. What, then, is the role of sexual dimorphism, its reverse, or its absence? There are good explanations in some instances, but not in all. Why there is a colorful breast band on the female kingfisher, for example, is hard to say⎯and the catch-all of sexual selection begs further study. It seems that in the end there is no ‘one size fits all’ explanation, especially if the topic is isolated from other factors. On the contrary, there are an infinite variety of evolutionary strategies, among which the phenotype is only a single, visible parameter. Perhaps the single endpoint to keep in mind is that whatever leads to the breeding success of the individual over its lifetime will be passed on to its offspring. What holds true for raptors may not apply to other birds, and vice verse. 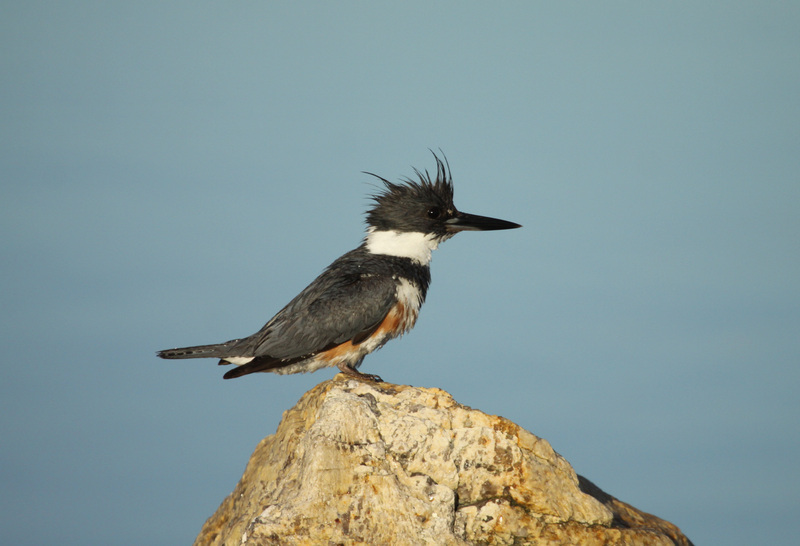 “The Belted Kingfisher” is taken from Best Seashore Nature Sites of Midcoast Maine, a work in progress and a collaboration between writer and photographer Tony Oppersdorff and writer and editor Kyril Schabert.